Big (over 2 1/2 feet tall! ), easy to build model! Makes a great first or second rocket kit! Designed with the beginner in mind, but it's also a great sport flier for modelers of any experience level. Features balsa fins and nose cone, payload section (big enough to hold many commercial electronics), quick change engine hook and bright parachute recovery. 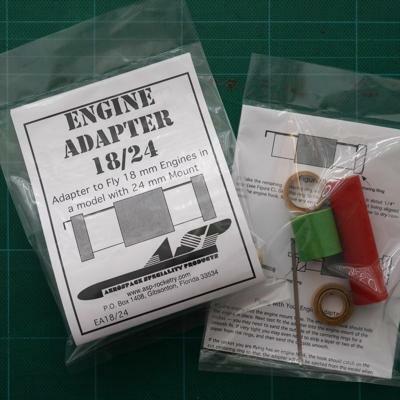 Designed to fly primarily on 24 mm engines, it can also fly on 18 mm engines with an adapter (EA 18/24, not included). 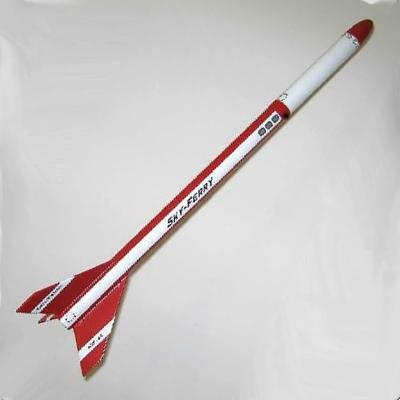 Great model to learn basic rocketry modeling. Perfect for school or scout groups - bulk packaging available. For the discounted quantities of 6 or more the kits are provided in bulk form with a single set of instructions (which may be photocopied if desired for each modeler). Required: Adhesive (A wood glue, such as Elmer's Carpenters Glue or Titebond can be used for all steps and is recommended. Cyanoacrylate [“CA”] glue is recommended, but not required, for a few steps. Other adhesives may be used if you are familiar with their use and prefer them. ); sandpaper (medium - 220 or 280, fine - 320 or 400, & [optionally] extra fine - 500 or 600); pencil or ball point pen; felt tip marker; scissors; cotton swab (“Q-Tip”, or piece of scrap balsa wood); hobby knife with a sharp #11 blade; metal straightedge/ruler; tape. Optional: sanding sealer (or balsa fillercoat); thinner (appropriate type for the sanding sealer); small paint brush; paint (Spray paint, such as Krylon, Pactra or Testors is recommended. Be sure not to mix different types or brands of paint without testing.) - primer, colors as desired & clear, filler material (such as Elmer’s Fill & Finish, Elmer’s Professional Carpenter’s Wood Filler or interior spackling paste); sanding block; tack cloth. Electronic launch system; launch pad with 1/8" or 3/16" launch rod (the combo Electronic Launch Systems with Launch Pad by either Estes or Quest will work); recovery wadding (either Estes or Quest); engines (see list of recommended engines above).